Celeb Gossip News – Britain’s Brexit Endgame Is Close. Here’s How It May Play Out. Britain’s Brexit Endgame Is Close. Here’s How It May Play Out. Britain is scheduled to leave the European Union on March 29. If it is to avoid a chaotic withdrawal — one that could leave ports blocked and food and drugs running short — it needs an agreement spelling out divorce terms from the European Union. Once that critical document has been finalized, it must be approved by the European Parliament and by British lawmakers in a climactic vote. So time is running out. For months, negotiations were deadlocked in Brussels while Prime Minister Theresa May’s divided Conservative Party was in turmoil, a reality underscored on Friday by the surprise resignation of Jo Johnson, a transport minister, over withdrawal from the bloc, known as Brexit. So far Mrs. May has survived, inching her way toward an agreement, and she hopes for a breakthrough in the coming days. But the parties are not there yet, and Britain’s domestic politics are combustible. Here is the state of play. The prime minister has put her jittery cabinet on standby to endorse a deal she believes she can strike with the European Union. On Friday, she met with the French president, Emmanuel Macron, and talks with European officials will continue through the weekend. Her hope is to convince her cabinet to sign off on an outline agreement early next week. It would then be blessed by European leaders at a special meeting at the end of the month. But crucial details remain to be resolved, and Mrs. May is performing a balancing act, trying to strike a deal with Brussels without prompting more resignations from her government. Mr. Johnson, who campaigned in the 2016 referendum to remain in the European Union, is a brother of Boris Johnson, a leading advocate of Brexit who quit his cabinet post as foreign secretary in protest of Mrs. May’s strategy for withdrawal. There are several, but one stands out — the Irish border. Everyone agrees that, when Brexit happens, there should be no physical border between Northern Ireland, which is part of the United Kingdom, and Ireland, which will remain in the European Union. The question is how to keep the border frictionless when the United Kingdom is no longer part of the customs union that facilitates uninterrupted trade within the European Union. The pro-Brexit fundamentalists have offered gauzy visions of high-tech wizardry that would remove the necessity for physical checks of vehicles. But that has widely been dismissed as pie in the sky. The European Union is demanding a “backstop” plan for the time before that technology is in place. Under its proposal, Northern Ireland would remain inside the European customs union and much of its single market. Mrs. May says that would unacceptably split the United Kingdom in two, with Ireland effectively annexing Northern Ireland and creating a border in the Irish Sea. A breakthrough seems to be close on a compromise that would place the entire United Kingdom in a temporary customs arrangement with the European Union. 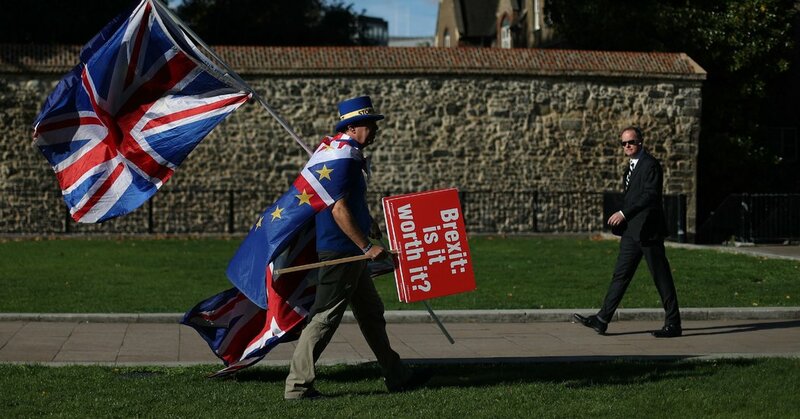 But hard-line Brexit supporters fear that Britain could end up being locked indefinitely into Europe’s customs rule book, dashing their dream of breaking free and striking trade deals around the world — the so-called “vassal state” they warn about. So their acquiescence could depend on the fine print, such as how the backstop would end. Is That the Only Opposition? No. Most opposition Labour lawmakers are likely to vote against the emerging deal, if it comes together. More worrying for Mrs. May is the reaction of the Democratic Unionist Party of Northern Ireland, which has considerable leverage. As Mrs. May’s sole partner, the party, known as the D.U.P., props up her Conservative government, which lacks a parliamentary majority. The D.U.P. dislikes anything that puts Northern Ireland in a different category from the rest of the United Kingdom, as any backstop plan would do, at least to a limited extent. If the D.U.P.’s 10 lawmakers rebel, it will be very hard for Mrs. May to get any agreement through Parliament. Will They Ever Reach a Deal? If the prime minister can persuade her cabinet and European leaders to agree on a deal, she can argue that her plan is the only alternative to a chaotic and economically damaging “cliff edge” departure. She will tell Brexit supporters that the failure to secure an agreement could lead to a political crisis that could sink any chances of withdrawal. And she will try to enlist business chiefs and global leaders to endorse her plan as the best way to prevent an economic shock. But the outcome could come down to a handful of votes in the British Parliament, so nobody knows for sure how it will go. One thing is clear: Even if Mrs. May succeeds in Brussels, she has a big battle on her hands back home.